Parathyroid removal is recommended when the small glands begin to malfunction. The parathyroid glands produce parathyroid hormones that are responsible for controlling calcium in the blood stream. Too much calcium can lead to bone spurs and may indicate the speed at which bones lose calcium. When bones begin to lose excessive amounts of calcium, the risk of a break or fracture increases dramatically. Overactive parathyroid glands that produce too many hormones, causes a condition called hyperthyroidism. Hyperthyroidism can be a contributing factor in degenerative bone conditions such as osteoporosis and osteoarthritis. 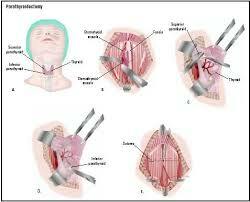 A parathyroidectomy is performed by making a small incision in the neck, locating the parathyroid glands that are causing the problem and removing them. The procedure is extremely quick and has few side effects, although reactions to the anesthesia sometimes occur. Of the four, small parathyroid glands located behind the larger thyroid gland, only the ones that are damaged will be removed. In most cases, only one or two of the glands are diseased. In the rare instance that all four glands must be taken, a small portion of one of the healthier glands may be transplanted into the forearm to allow for the continued production of parathyroid hormone.